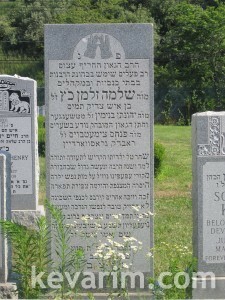 The Rav’s Son buried to his left was Rabbi Dr. Henry (Chaim) Katz who passed away feberuray, 2008, here is an obituray and photos of the son, with some more information on his father and the family. Rabbi Shlomo Zalman Ben Rabbi Yonason Binyamin HaKohain Katz’s Niftar date is Ches 8th day of Sivan 5722. June 10th, 1962.